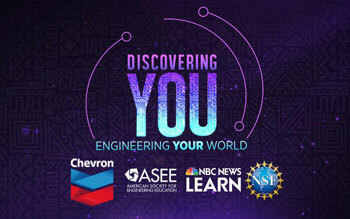 Produced by NBC News Learn, the education division of NBC News, in partnership with Chevron, the American Society for Engineering Education (ASEE), and the National Science Foundation (NSF) “Discovering You” is an original 20-part video series. Each video installment showcases what motivates a diverse group of engineers both academically and professionally, including teamwork, creativity and making a difference in the world around them Aligned to state and national education standards, each video has a downloadable lesson plan for educators to use in the classroom. Emmanuel Rivera is mechanical engineer and human resources representative at John Deere. His work can been seen at the tractor cab assembly operation in Waterloo, Iowa, where massive tractors are put together for farmers around the world. Taniya Mishra is a speech and artificial intelligence scientist for Affectiva. She is working to make the relationship between humans and technology easier through emotion AI.